Have you ever thought about the amount of food waste you throw into your trash every day? Perhaps the idea of composting has crossed your mind once or twice, only to be dismissed as an unrealistic dream for city-dwellers. Where would I put it? How do I start? What do I do? And how bad does it smell? The process of composting involves making a pile of organic materials, which breaks down over a period of weeks or months and condenses in volume. 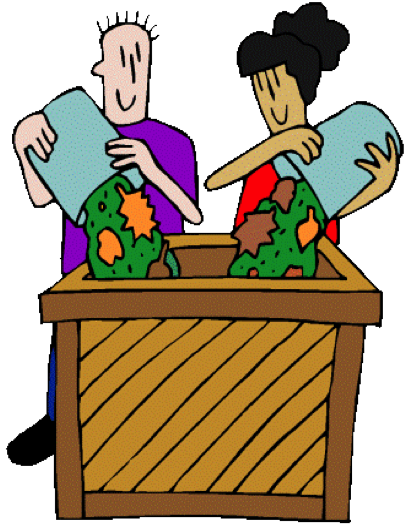 Composting serves to reduce trash from food waste and to create fertilizer for gardening. Compost can consist of food scraps, lawn trimmings, leaves and hay. It can be daunting to think about composting in a city. But it’s certainly not impossible. Many city-dwellers successfully compost year-round. For example, Meredith Epstein, a first-year Friedman School student composts with her roommates in their Jamaica Plain apartment. 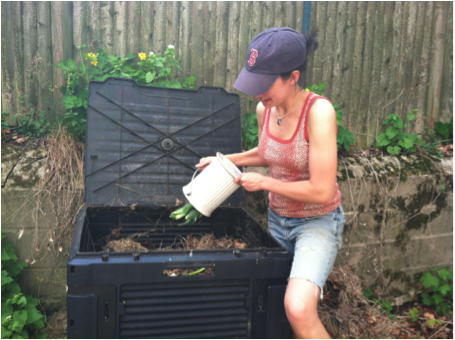 Meredith came to Boston with a wealth of composting experience. During and after college, Meredith ran a community garden with three staging areas of compost piles and worked on a project at St Mary’s College of Maryland to create a campus-wide composting program. She is also trained as a certified composter, which is required in order to sell compost or use it to grow certified organic foods. Meredith and her roommates have a small compost pail ($10-30) next to the sink for food scraps, and a black plastic bin ($30-100) in the back yard that can hold about 75 gallons of food waste. 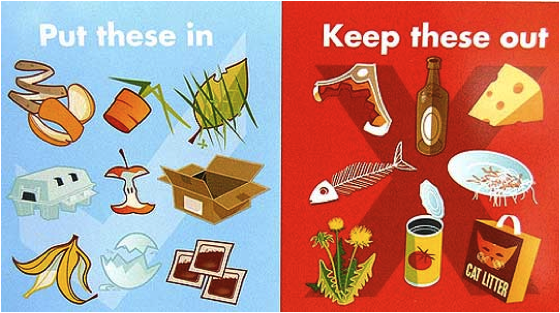 Meat, oils, and dairy should not be composted, as they will attract animals to the bin. Meredith’s house does not “turn” the compost – mixing it under the right conditions creates finished compost that can be used as garden fertilizer – they just put food waste in the bin instead of in the trash. Because so much of their waste is food matter, they only take their kitchen trash out once a week. That adds up to a lot of waste rerouted from the dumpster. Adding hay or dried leaves on top of the food waste helps the food break down faster, reducing the volume of material in the bin. Meredith’s roommate, Leigh, composting in the back yard. Photo by Meredith Epstein. If a backyard bin is not an option, other resources exist in the Boston area. Bootstrap Composting is a compost pickup company used by many Friedman students. Bootstrap provides a 5-gallon bucket that you fill with food scraps and leave outside once a week for pickup. They come by and swap out your full bucket for an empty, clean one for just $8 a week. If you require less frequent pickup, biweekly and monthly pickups are available for as low as $10 a month. Bootstrap will also return a portion of your waste in usable compost, if you want. Wormorama is a similar company, but it only provides service to Allston residents. However, they also offer customized compost setup and training at your house. Worm composting is another option for those without a back yard. Because worm bins are smaller than outside bins, worm composting generally requires that you have less food waste. Worms break down food waste into a rich, dark compost material. Worm bins can be kept inside an apartment, or outside on a porch if the weather is warm enough. They can be purchased or easily built using few materials. For more information about composting in Boston, including how to start and where to get bins and buckets, visit the City of Boston website. Ashley is a first-year Nutrition Communications student at the Friedman School. She grew up in Vermont with a large garden that was nourished by the compost her family produced. She loves eating all fruits and vegetables and encourages people in the city to try out composting to save all that waste from going in the trash!